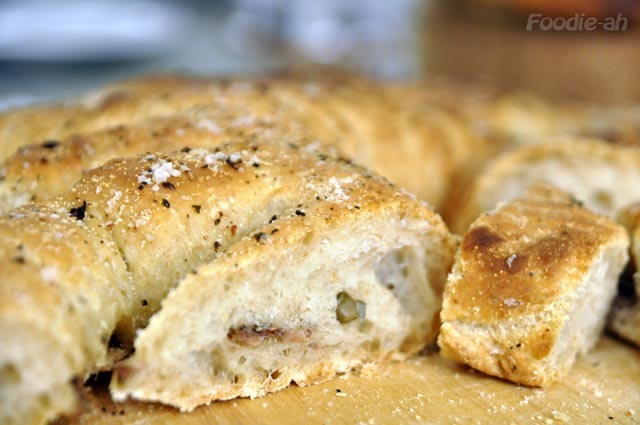 In my quest for bread making, I fell in love with Fougasse Provençale. 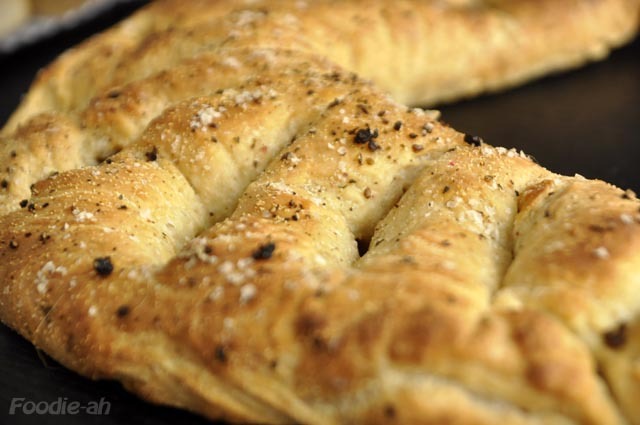 It's rustic, it's flavourful, it's crusty, it looks beautiful, it can be paired with tasty ingredients. It has everything I like about bread! I decided to make 2 different fougasses, one with anchovies and capers, and one with sun dried tomatoes. Following, the recipe I used, which I derived from the great book "Bread", by Jeffrey Hamelman. I do all my kneading by hand as I don't have a kitchen aid, but also because there is a certain fulfillment in handling the dough and feeling it develop between your hands. It's messy, especially with wet doughs such as this one, but once you practice it a few times, it's easy enough to do. If you use a robot you will have to adjust the recipe for that. Start by making a pâte feementée a couple of days in advance. This is a small amount of dough, which you can ferment slowly in the fridge, in order to give flavour to the bread. Mix flour and salt into a bowl, and tepid water and yeast in a glass, then combine and knead for a while, until smooth. Keep it in a large bowl, covered by a cling film (I usually rubber-band the film around the bowl, to keep it tight). Leave at ambient temperature for a couple of hour or so, until it starts to rise, then put it in the fridge at about 3-5 degrees overnight. The next day, remove from the fridge, and let the dough raise slightly (about 50-60% increase in volume). Now it's time to make the main dough. Follow a similar process as before. Mix both the flours and salt in a bowl. In a separate container, mix tepid water with the yeast and the olive oil. Combine the two and start folding in the dough, until it reaches a certain consistency and the flour is almost all incorporated. You can then add the pâte fermentée chopped into little chunks. Keep mixing and then kneading with your hands. Since the dough is so wet, don't even try to keep your hands neat. I actually get them both dirty. I lift the whole dough with my hands, and keeping them both horizontal, I roll the dough in between them, rolling one around the other at the right momentum, so that the dough doesn't fall. It will take probably 5-10 minutes of kneading this way before you reach the right level of stretchiness. At that point, you can spend another 10 minutes scraping the dough off your hands with a spatula, collecting it all into a large bowl. Let it rest for about an hour or so, then give it a stretch & fold and put it in the fridge to let it rest for another 12 hours. Pull the dough out of the fridge, and let it rest at ambient temperature and raise until it double its original size. Pull it out of the bowl onto a floured surface and flatten it with a rolling pin into a round shape. If it's too nervous, let it rest for 10 minutes and then stretch it again. Dry the anchovies from the olive oil, using some kitchen paper to absorb it. Alternatively, if the anchovies were preserved in salt, wash them first from the excess salt and then dry them with kitchen paper. 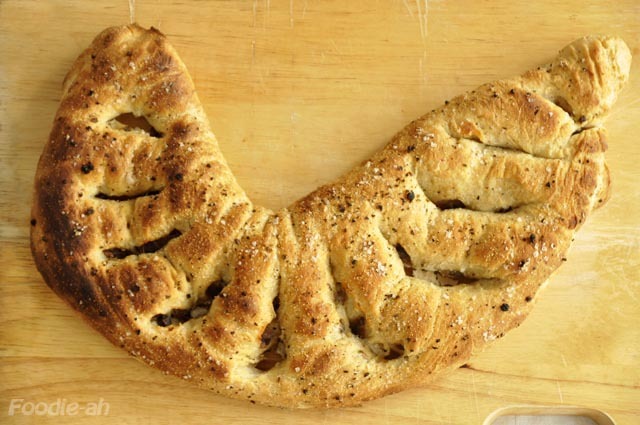 Arrange them onto half of the flattened dough, all parallel, in the same direction. Add a few capers here and there. Fold the other half of the dough on top of the anchovies, make it stick, and then flatten the dough again into the final, desired shape. Using a pizza cutter, make incisions on the flat dough, cutting across the anchovies or sun dried tomatoes. Finally, stretch the dough to enhance the incisions, sprinkle some semolina flour on top, cover with a cloth and let it raise for an hour. Now the dough is ready for baking. 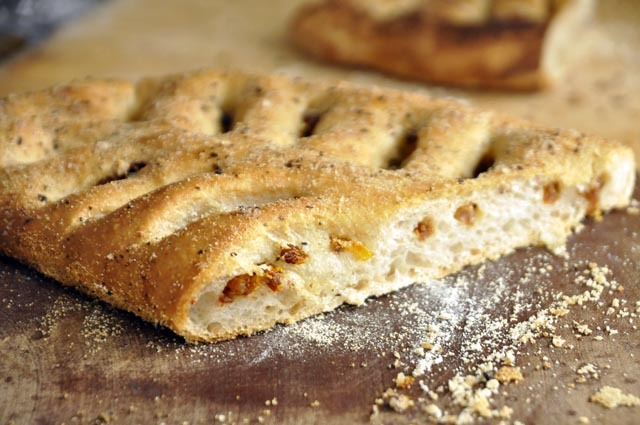 I like to have my fougasse with a nice golden crust, so I suggest that you spread a thin layer of extra virgin olive oil on top of it using a very soft brush (I bought mine at Sia Huat). Sprinkle again with some semolina, some crushed peppercorns, and some salt flakes. I used Murray river salt flakes, which you can buy from some Cold Storage branches. Bake the bread in a fully heated oven at 230C for about 20 minutes. It is imperative that the dough is placed on a hot tray or preferably on a hot baking stone. Transferring this onto the hot surface is not easy due to its stickiness. I use a pizza peel, but alternatively you can put yours onto some floured baking paper and then slide it directly onto the surface. Spray some water into the oven just before inserting the dough, directly on the sides, and repeat the operation a few seconds after the baking starts. Once the crust is nice and golden, the bread is ready. 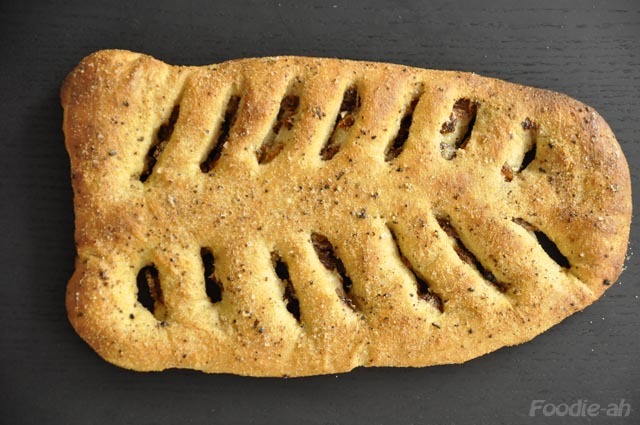 Remove it from the oven, and let it rest on a grill (don't put it in direct contact with a solid surface, to prevent the steam from making the crust soggy. Optionally, you might want to brush additional extra virgin olive oil while the bread is cooling. You must refrain from cutting and eating the bread while still hot, since its fragrance greatly improves 30 minutes to an hour after baking. It is indeed a lot of work, but the result is incredibly rewarding!